New Year marks a new beginning. Celebrate with a new take on this tasty, nutritious and collagen-rich soup that’s chock-full of flavourful additions like shark’s fin and squid paste. Simply the perfect start to any dinner menu. Mix minced meat, squid paste and shark’s fin with marinade till smooth. Roll 25g of mixed paste into an abalone-shaped ball, then spoon 8g of shark’s fin and place the ball on the shark’s fin. Steam for 5mins and set aside. Wash kampung chicken and cook in a pot of water for 3mins together with chicken frame and chicken feet. Remove and wash the cooked chicken, strain dry and set aside. 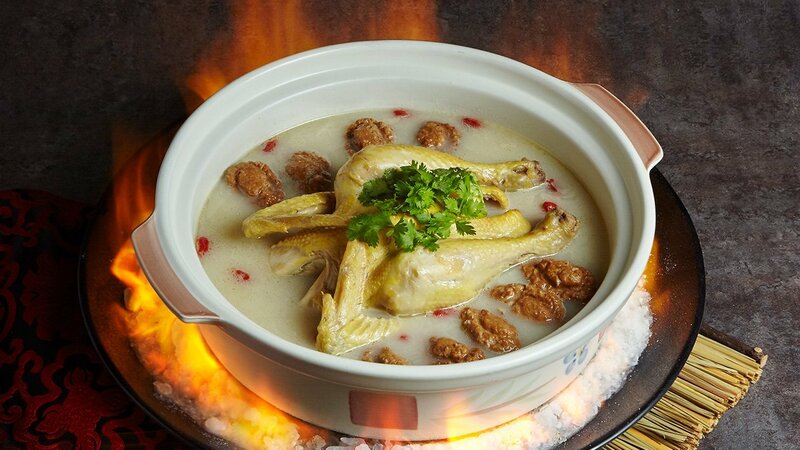 Place kampung chicken, chicken frame and chicken feet into a claypot, add 4kg of water, bring to boil for 1 hour. Remove kampung chicken and set aside. Remove chicken frame and chicken feet and stir fry with spring onions and ginger slices till fragrant. Return to the claypot and bring to boil till the remaining soup reduces. Remove ingredients and strain soup base. Add seasonings, kampung chicken and shark’s fin balls. Bring to boil for 3mins. Garnish with wolfberries and coriander. Ready to serve.